National Assembly Chairwoman Nguyen Thi Kim Ngan met with leaders from Western Australia to seek cooperation opportunities in various fields of mutual interests such as mining, renewable energy, liquefied petroleum gas, education-training, tourism, seaport and agriculture. At a meeting with Governor of Western Australia Kerry Sanderson in Perth city on December 1, Chairwoman Ngan expressed her belief that the elevation of the bilateral strategic partnership on the occasion of Prime Minister Nguyen Xuan Phuc’s visit to Australia in March 2018 will create a foundation for the two countries’ localities and businesses to carry forward cooperation. She noted that two-way trade reached nearly 984 million USD in 2016. Vietnam is the 16th biggest trade partner of Western Australia. Sanderson affirmed that the Western Australia administration attaches great importance to cooperative relations with Vietnam. Vietnam has a lot of potential to develop tourism with popular destinations like Hoi An ancient town, Son Doong cave, and Ha Long Bay, she said, adding that it is necessary to open a direct air route between Vietnam and Perth. The two sides discussed fields that need stronger collaboration in the future such as education, culture, tourism, science-technology, education-training and people-to-people exchanges. While meeting with President of the Western Australian Legislative Council Kate Doust and Deputy Speaker of the Legislative Assembly of the Western Australia Lisa Baker, Chairwoman Ngan described the Western Australia as a world’s leading natural resources mining centre and a top educational centre of Australia, which plays a significant position in the Vietnam-Australia cooperation. Vietnam supports businesses from the state to strengthen trade and investment partnership with Vietnamese localities in order to increase two-way trade to 2 billion AUD (1.5 billion USD) in the coming time, Ngan said. 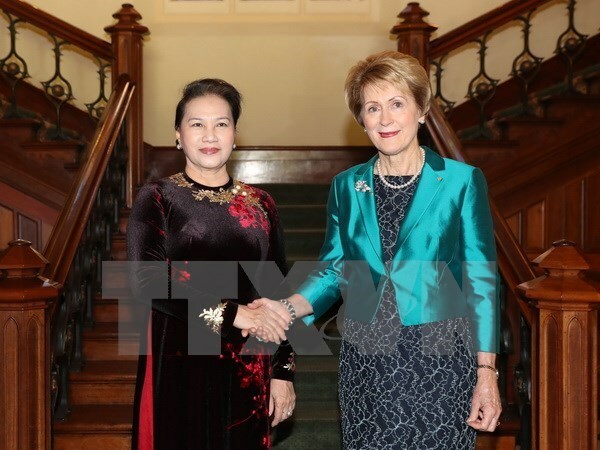 She called on the Western Australia to support Vietnam in the fields of its strengths such as agriculture, livestock, water management, and education. The two Western Australia’s legislators said they want to promote cooperation with Vietnam in science-technology, education and economics. At a meeting with Chief Justice of Western Australia Wayne Martin, Chairwoman Ngan hailed the signing of a cooperation agreement between the Supreme Court of Western Australia and the Supreme People’s Court of Vietnam. She hoped the Supreme Court of Western Australia will support the training of Vietnamese judges as well as share legal information and experience in judicial administration. NA Chairwoman Nguyen Thi Kim Ngan is on an official visit to Australia.